You Are Here: Home » TLC Blog » Google Rich Snippets: Why Do I Need One, and How Do I Get One? As the quantity of information on the web grows bigger and bigger each day, search engines are constantly updating and refining the way they identify and display that information. According to statcounter.com, Google performed 92% of all searches in February 2019, with the other 8% spread across the rest of the engines. In this post, we’ll concentrate on what Google is doing to further its mission “to organize the world’s information and make it universally accessible and useful.” Google continually changes its search algorithm to make the information it retrieves most useful to you, the user, who is asking the question. When we process information, our brains can digest best it in small chunks (think of a business card or a recipe card) that are organized in a logical way. Rich snippets, also known as featured snippets, are Google’s way of replicating this analog way of organizing. Rich snippets are designed to give specific answers to search queries that are question-based. When you ask a question, instead of displaying a series of websites with short descriptions, i.e., your meta description, Google may show a rich snippet at the top of its results page, called position 0, and then list other websites that meet your search criteria. Position 0 appears above position one, and even above many advertisements. Google might choose data from your page for position 0 if your page is optimized for a particular type of rich snippet. (There are a lot of other conditions to get that coveted position 0 spot, but being optimized for it is certainly a start.) Google is also trying to optimize for voice search and searches from mobile devices, which have become the most common method of searching. Rich snippets generally are compact and neatly fit the real estate on a mobile device. So what is a Google rich snippet? First, we will analyze what they contain. They come in four basic flavors: paragraph, table, list, and video. The example above is a basic paragraph snippet, which is exactly what it sounds like – a paragraph of text. But paragraph snippets can have many variations, such as music, events, reviews, or products. Each type of snippet is made up of the same kind of data. Schema.org is where you go to find out exactly what fields you need to use for a particular snippet. Google also has documentation on structured data that is a little easier for a non-developer to understand. If you do create your structured data on your own, Google has a structured data testing tool for you to check it. If your site uses WordPress, there are multiple plugins to help you create your structured data. Just search for “Structured Data” in Plugins. A table snippet is created by Google when it sees a graph or table on one of your pages that answers a query. 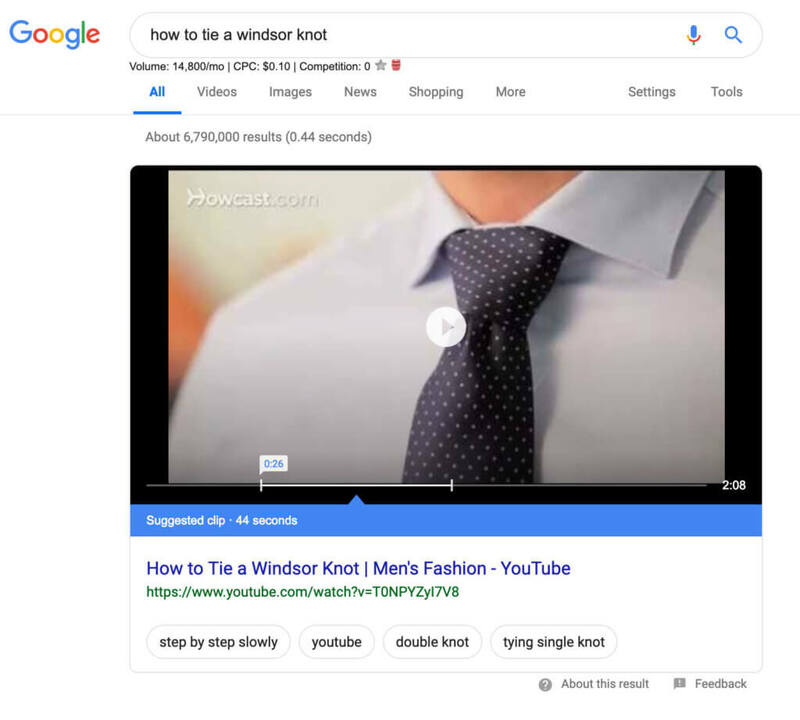 Without knowing exactly what the Google algorithm is (that’s proprietary information), it appears that the table snippet is created for the top 10 organic SERP results to a particular query. 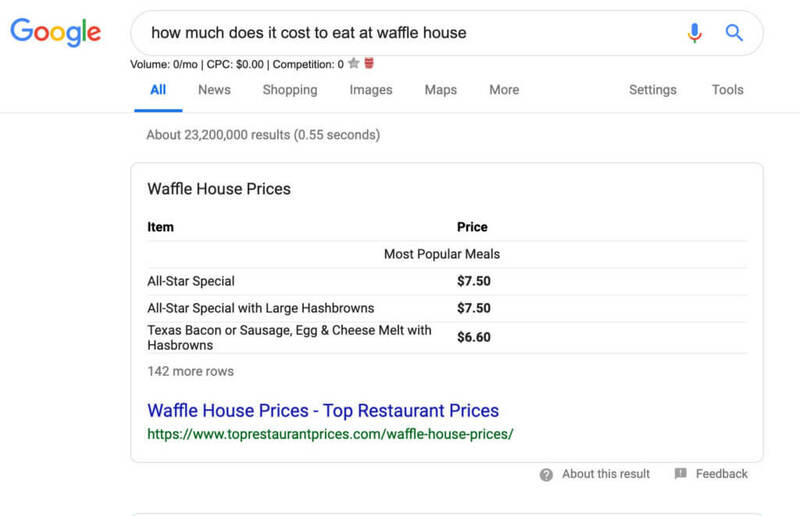 so if your site has a graph or table that answers a particular question, such as “How much does it cost to eat at a Waffle House?” then you are in luck. The List Snippet is much like the paragraph Snippet except that the information is categorized into a series of simple steps. A recipe is a type of list snippet. For example, a recipe should contain the name, ingredients, step-by-step directions, time to create, etc. 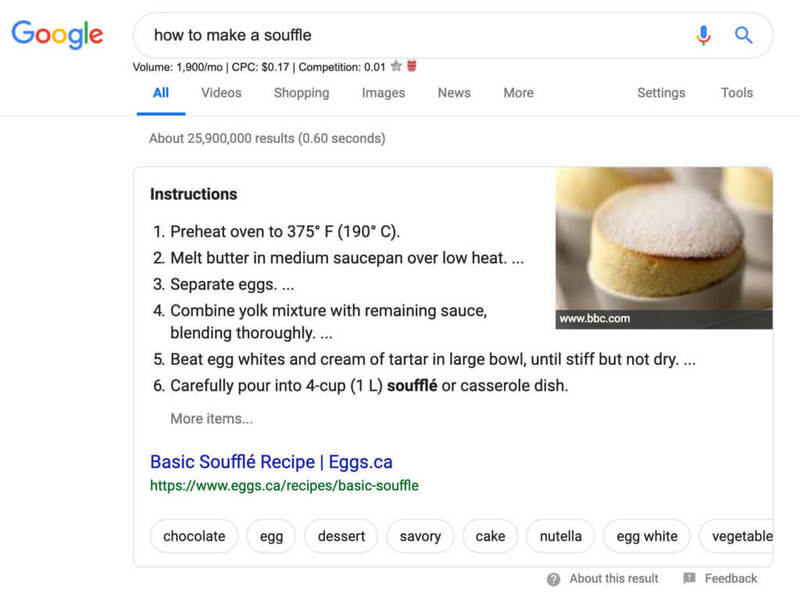 If your site contains recipes, you will want to structure your data (or schema) on your posts so that Google can capture that recipe information. If your site is WordPress, there are plug ins that will help you create recipes. 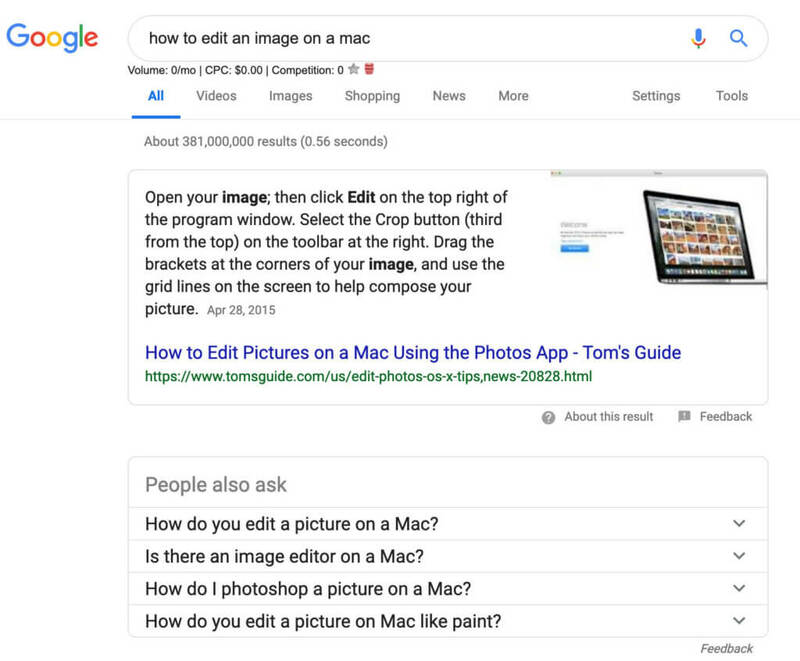 Video Snippets appear when Google thinks they may answer a user’s question. They contain a title, link, and description along with the video’s thumbnail, duration, and upload time. Think about asking how to tie a Windsor knot. It is much easier to understand a video showing the process than to list the steps involved. Video snippets have replaced many list snippets for simple instructions. So How do I Make a Rich Snippet? Now that you know what rich snippets are, how do you create them? The short answer is, you don’t. Google does. That being said, by structuring the content of your pages and posts, you can encourage Google to create rich snippets from your information. Also, rich snippets are not a static creation; they are created on the fly from information that Google finds when a question is asked. Here are some suggestions on how to optimize your content so that Google may turn it into a rich snippet. If you have lists of information on your pages, make sure that the items are categorized with H3 tags. Google looks for H3’s when it creates list snippets. If your site features DIY videos, make sure there is a text version of each video. You should be hosting your videos on a service such as YouTube (your video will load faster if it is not being stored on your site). YouTube has a transcript extraction tool (see how to use it here) that you can use. Make sure your video is organized into small steps that can then be chunked together in the transcription. Make sure you use your focus keywords in your introduction, and paste that introduction into the description of the video. Your content should be in short sentences and paragraphs, each having no more than 40 to 50 words. And it should include your focus keywords. But don’t sacrifice readability! User readability should always be the primary goal. If it makes sense for your content, create your posts in a FAQ style, so that you can optimize keywords in the form of questions, and make those questions be subheadings. And if your site does not already have one, get an SSL security certificate. Most larger hosts offer them free now. According to SEM Rush, 83% of sites that earned featured snippets had an SSL (https:// vs. http://). Structuring the data on your site has never been more important. And as Google’s algorithms get more sophisticated, they will increasingly rely on pieces of data within your pages to create a snapshot of your site. So, start thinking about the pages on your site and how they might answer specific questions that your potential customers/users ask. Check out Google’s structured data tool to see how your content fits certain schema. Optimize your pages for those questions in the correct schema and you might get rewarded with a rich snippet! Timely info. I was just going to ask about this in Slack today. Cheers! Sounds like a new thing is on the horizon. Thanks, Jodi. I was using the terms sort of interchangeably, but you are correct that they are not. The basuc paragraph snippet seems to be something that you can control via your meta description, but the other snippets (the rich ones) are built by Google using your structured data. In the case of a review snippet (say, for a movie), Google may aggregate from many sites to come up with a rating.